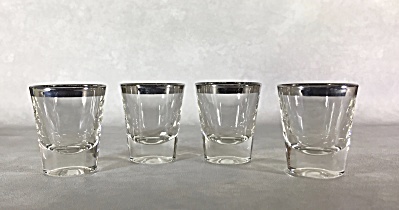 Ever need four identical shot glasses? Well, of course you do for the next time you want to do "shots" at one of your cocktail parties for four! A heavy band of high quality silver is found on these glasses. I suspect with their slightly recessed bases and the quality of the silver that they may be by Dorothy Thorpe from her line of barware. Excellent condition.